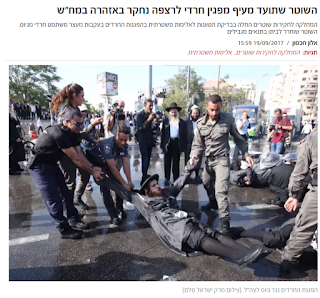 Last week I speculated that Netanyahu might use the current coalition crisis over Haredi draft-dodgers to call a snap election, which might freeze the indictment process and return Likud with a strong win as predicted by the latest polls. Now the opposition parties are all over the election issue, threatening to slow down the process to 6 months. Why? Because they know the truth – that despite all the police leaks, media bias and Saturday night demos, Netanyahu’s base will solidly support him, as will the many floating voters who see no other party leader better suited and connected to deal with the issues of the day. Now, with elections possibly imminent, Lapid’s party say that they would share power with Likud even if Netanyahu is indicted. The hypocrisy is stunning. So far there is no breakthrough with the Haredi parties who are refusing to pass the budget without a draft exemption law for their yeshiva students. You may well ask: what has draft exemption got to do with finance? The answer is: nothing. But perhaps they could be connected in terms of a solution. Let’s give them their precious exemption, but – with the other hand - withdraw all government funding to yeshivas opposed to army service. This would be a spur to the further growth of the Hesder yeshivas, which combine Torah study with preparation for army service, and later life as productive working citizens of the state. It would also punish those Haredi yeshivas whose Rabbis consistently turn a blind eye to their students’ attacks on religious soldiers in uniform. Such a disgrace and Chillul Hashem.